WHO DARES ENTER THE APPLIANCE HUNTER'S DOMAIN??? Oh, you're looking for appliance reviews you say? Well yes you'll find those here but... Yes? Well yes, it is my job to hunt out and find the best appliances but... but... OK, OK, you can carry on. There is nothing worse than opening up your washing machine to put a load on and getting a horrible smell hitting you in the face. And you must know what I mean because that’s why you’re here! There are two different methods you can use that are almost guaranteed to work, then just a couple of things you can do to prevent it in the future. You can use any essential oil I just prefer Lavender, it makes me think of clean laundry! Step 1. Mix 200 ml of white Vinegar with 200 ml of water (less if you have a particularly small washing machine) and put in about 15-20 drops of your essential oil. Step 2. Pour this into the detergent drawer and start a normal wash cycle with the drawer empty! Step 3. You have a nice fresh washing machine. Now a slight alternative you can use. Step 1. Mix 50 ml of baking soda with 50 ml of water, mix, and pour it into the detergent tray. Step 2. Pour about 400 ml of vinegar straight into the drum. And turn on for a normal cycle at high heat. Step 3. Lovely clean washing machine! There isn’t much difference between the two techniques, it’s just that people tend to have vinegar but not enough baking soda so thought I should include some alternatives! 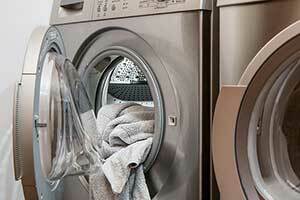 How Can I Prevent My Washing Machine Smelling In The Future? Now that you’ve got it clean you don’t want it to start smelling again. Keeping the door open after you finish a wash goes a long way to preventing any smell. It let’s the drum dry out so no mould can start to grow, or anything else to take life and start smelling. Overly cheap detergents tend not to break down properly. This leaves them in big clumps and is sometimes what starts to smell. So avoid own brand detergents and other cheap alternatives. You don’t need to clean it too often, once every three months using the above techniques should be fine. But if it starts to smell just repeat!